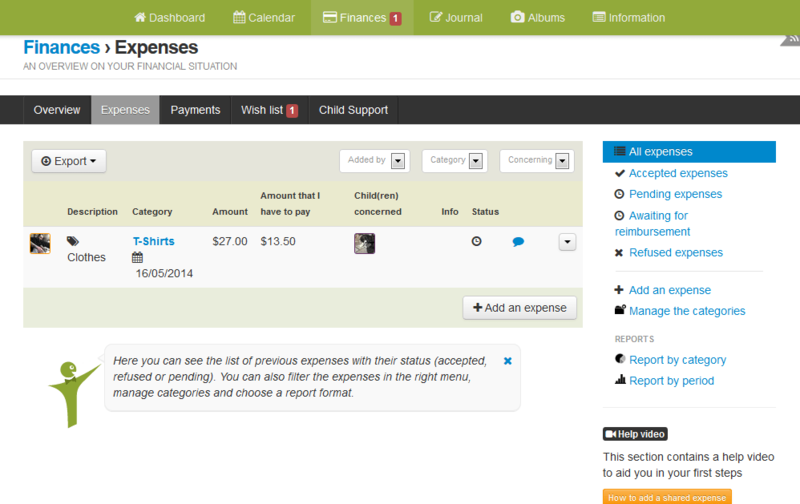 2houses manages the shared expenses between separated parents. Do you find it difficult to manage your budget between your expenses for your child that are shared and the ones that are not? It’s not difficult anymore, 2houses takes care of everything! 1) First, click on “Finances” on the upper menu, then on “Expenses” on the black menu, and then click on “Add a first expense“. 2) If you haven’t done it before, you have to create a category for the expense (Each category has its own sharing ratio.). Click on “Add a category” to add one, and enter the required information, and click on “Save“. 3) Once you’ve chosen the right category, add a title to your expense, check the box of the concerned child, add a date, the amount of the expense, and if you want to, you can add a note and a file from your computer (bill, picture, or anything else). The system will automatically divide the amount according to the category you chose. You can also inform the system that this expense will be partially refunded by someone other than the other parent (such as a refund by the Health Service). Once you’ve added all the required information, click on “Save” at the bottom of the page. Your expense is now displayed in the list of the shared expenses and the other parent has been notified that an expense has been added and informed about the amount to refund. You just need to wait for him/her to accept or refuse the expense. That’s it! You’ve added your first shared expense! It’s now that easy to manage all of your financial records!